The Girl Behind The Burger! Perhaps you have stopped into Nello’s for lunch during the week and have had the fortune of trying the weekly burger special, each week something new, with an incredible twist on what most envision a burger to be. If you haven’t you are in for a treat! Where do these creative, juicy indulgences on our traditional Parlor Burger come from and how do we create them each week with unique & tantalizing flavor concepts? Introducing Chelsie, the girl behind the burger! Part of our morning kitchen crew, Chelsie, is the woman behind our unique & delicious burger concepts. Each week she interchanges ingredients that compliment each other while widening the spectrum of your taste buds. Mouthwatering burgers that leave you waiting to find out what next week’s burger might be, and planning your lunch hour accordingly. Chelsie has been a part of our Nello’s crew for about 3 years now and came into her position with a passion for food, cooking, and creating! You might know of her as well, if you have had the opportunity to try one of her delectable gourmet rice crispy treats, cinnamon rolls, and other sweet treats that sometimes are available at our take out window. Are you hungry yet??? 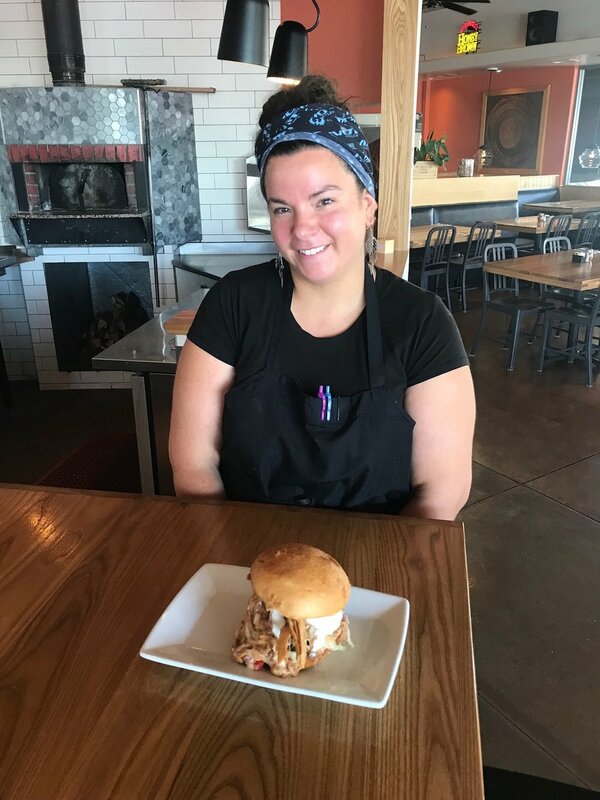 We decided to sit down with Chelsie, the girl behind the burger, and get to know her love for cooking , where she gets her ideas from and what exactly goes into creating her spectacular burger specials! Chelsie is always in a cheerful mood and brings her all to anything she does in our kitchen. When I asked her about how she started cooking she immediately brightened and told me she’s been cooking since she was 5! Barely old enough to reach the kitchen counter she would try her small hands at making Jello no bake pudding for her always supportive dad. In fact her grandmother and mother are both great cooks and she believes that’s where her love for cooking stems from! When I asked her about where she gets her burger ideas, she explained that sometimes they just come to her and other times she looks through recipe books or chooses a theme and compiles different flavors that she thinks will go well together. She also likes to incorporate local and seasonal ingredients because after all that's what Nello’s is all about. Well this girl certainly has a knack for some amazing creations! Her favorite burger creation so far incorporated a watermelon salad topping it. She explained that it was amazing ( and tasty) to find that the watermelons kind of mimicked what tomatoes do for a burger but at the same time awakened your taste buds! The names she gives her burgers..think “The Best Dressed” in the spirit of the Oscars, “Fancy Pants”, “The Pittsburgh” and “The Zinfandel Burger” to name a few, are always creative and are fun at that. Chelsie however, says that naming the burger is the hardest part! 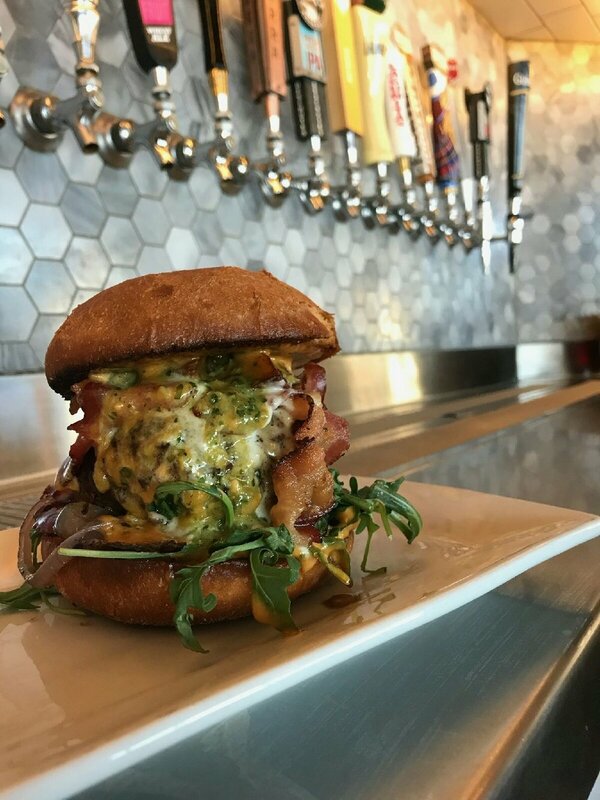 If you have yet to try one of her amazing burger creations we recommend that you make it in for a burger special anytime between 11am-2pm Mon thru Friday, trust us you won’t be sorry! Cheers to you Chelsie, the girl behind the burger! Second Family Style Dinner Night!